The soil is a precious and finite resource. However, global figures on soil degradation indicate that there is still lack of concerted effort to save this resource. By some estimates, 33 percent of land is already degraded. Over 24 billion tons of soils were lost to erosion on croplands worldwide in 2011 alone. Every day some 2,000 ha of farm soil is lost to salt-induced degradation. Today salt-affected soils make up 20 percent of all irrigated lands worldwide. And urbanization and contamination are adding to this problem. There is now a growing understanding of the need to do more. And 2015 was a turning point for soil awareness efforts. First, the 68th UN General Assembly declared it the International Year of Soils. The initiative aimed to increase awareness and understanding of the importance of soil for food security and essential ecosystem functions. Second, the Intergovernmental Technical Panel on Soils (ITPS), the main scientific advisory body to the Global Soil Partnership (GSP), took the initiative to prepare the first-ever major global assessment on soils and related issues. The release of Status of the World's Soil Resources marks a major shift in attitudes on this matter. On December 13, 2015, the International Center for Biosaline Agriculture (ICBA) and Food and Agriculture Organization of the UN (FAO) organized a joint seminar at the ICBA head office in Dubai, the UAE, dedicated to the publication of Status of the World’s Soil Resources and the closure of the International Year of Soils. Speaking at the event, Dr. Ismahane Elouafi, Director General of ICBA, pointed out that ICBA has carried out extensive research on soil in different countries, including the UAE. Dr. Elouafi also noted that ICBA developed a number of technologies for soil reclamation and improvement. For example, the center conducted studies in the UAE on biochar production and potential use of sludge and biosolids in, among other things, agriculture, forestry and floriculture. According to the report, lack of soil nutrients is the greatest obstacle to improving food production and soil function in many degraded landscapes. To this end, the report suggests that, among other things, it is important to return crop residues and other organic material to the soil, employing crop rotation with nitrogen-fixing crops, and making judicious use of organic and mineral fertilizers. During the event, Dr. Shabbir A. Shahid, senior salinity management scientist at ICBA, noted that as global demand for food is set to grow, it is also necessary to adopt climate-smart agriculture practices. He pointed out that using proven methods and technologies and reducing food wastage can also increase food supply. According to Dr. Abdullah Alshankiti, senior soil management scientist at ICBA, biochar can be an important tool to increase soil productivity in areas with severely depleted soils, scarce organic resources, and inadequate water and nutrient supplies. However, sandy soils could benefit the most. As part of its research on biochar, ICBA also developed a low-cost technology for producing biochar from date palm and conocarpus. In an effort to support the UAE’s goal of achieving zero waste to landfill by 2020, ICBA also worked together with Ajman Sewerage Private Company Limited (ASPCL) to study the potential value of sludge and biosolids as a soil conditioner and a source of important plant nutrients. However, scientists argue that in the context of soil improvement efforts, it is also necessary to do more to reduce the amount of municipal waste going to landfills. Scientists believe it is an opportunity that private and government agencies should capitalize on. There are several benefits of using this type of soil amendment. First, it is better than animal manure as it is more stable and its positive effect lasts more than one year. 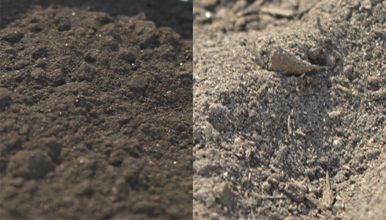 This soil amendment is also more effective at restoring the productivity of soils. Second, it will help to reduce environmental impact of municipal waste and contribute to sustainable waste management. As the UAE is working to reduce waste disposal in landfills, this could be one of the ways to go.